I've heard it called a couple different things, for the vinyl crafter it's probably most commonly known as Subway art. I don't really care what it is called, I just knew I wanted to make my own. And so I did. Step 1: Paint your canvas. This color will end up being the color of the words so pick a color that will show well. I just used an off white for mine. Step 2: Make a list of words. I had my family help and we listed words that we felt best described us. We have some pretty silly things on there, lots of inside jokes but honestly, it wouldn't be us without those. After you have your list, open a document program on your computer. I actually used an illustrator program and laid them out to scale. Then I printed them onto just regular printer paper. Step 3: Once all your words are printed out, spray the back side of the paper with spray adhesive and attach it to the front side (shiny side not sticky side) of the contact paper. Then cut all your letters out. TIP: Keep in mind the bigger your words are the easier it will be to cut out. Duh! Right? I know, but it needed to be said. Mostly because I learned the hard way. Bigger words will also help you in the painting stage too. 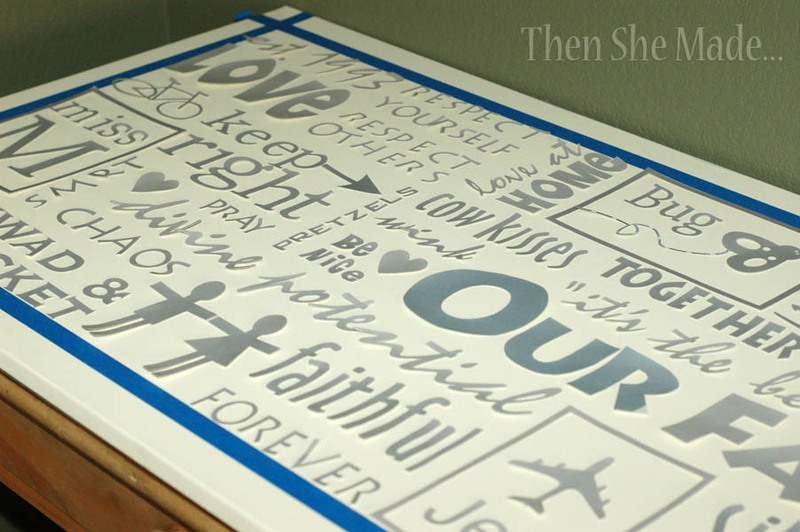 Step 4: Once letters are all cut out, lay them out in the position that they will go on your canvas. Don't stick them down yet though. Make sure they are all laid out and that they are spaced right. You won't be able to check the spacing until all of the words are out. Then, after everything is in it's place, carefully peel the backing off the contact paper and stick it down. Step 5: Start painting. If you are using a canvas be careful as the paint can seep under the letters. 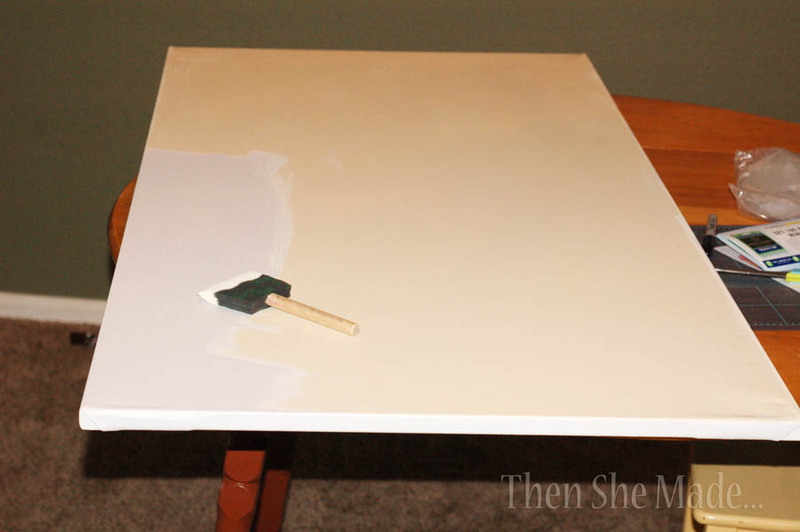 To avoid this issue, put your paint on top of the letter and spread it out onto the canvas. This way the paint will not pool up at the edge of the letter. Step 7: (optional) Sand it down. Because I used a canvas and it has a texture the words were not very crisp. Because of this I chose to give the whole thing a distressed look and used a fine grit sand paper to remove some of the paint. This distressed it all and made it look more complete and balanced. Step 8: Hang it up! It's not a hard project but it is time consuming. My canvas was very large but you could easily do this in less time on a smaller canvas. In the comments Shannon shared a great tip: "To keep the paint from bleeding under the letters, after you stick all of them down, give the entire canvas one coat of the off-white color before painting the top color. 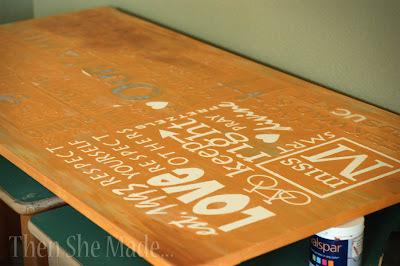 That way, in case any paint does get underneath the letters, it will be the same color." Thanks Shannon, I will most certainly do that on my next one! Super cute, Amy!!! Love it! Out of all the subway art I've seen, This is BY FAR the best! I absolutely LOVE it! 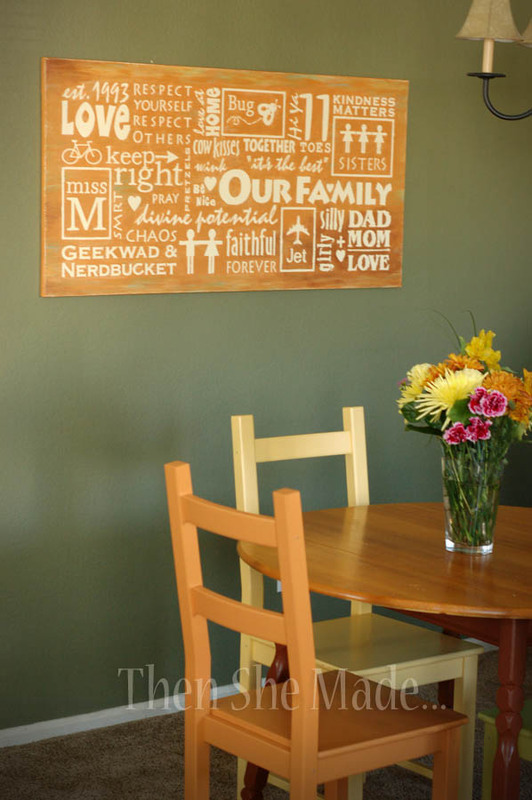 Tip: To keep the paint from bleeding under the letters, after you stick all of them down, give the entire canvas one coat of the off-white color before painting the top color. That way, in case any paint does get underneath the letters, it will be the same color. That is so fantastic! Love it! It turned out fabulous!!! I love that you have inside jokes that only your family would get. Makes it even better. I want to make one and I will need to do it like you as I don't have a cutting machine. So I'm glad you shared how you did yours. One of the best tutorials I've seen on subway art- Great! Shannon's tip is great, too. 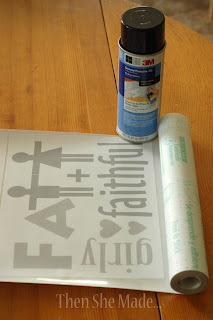 Would love for you to stop by tomorrow and link it up to Passion for Paint! cuter than most of the "subway art" i have seen. 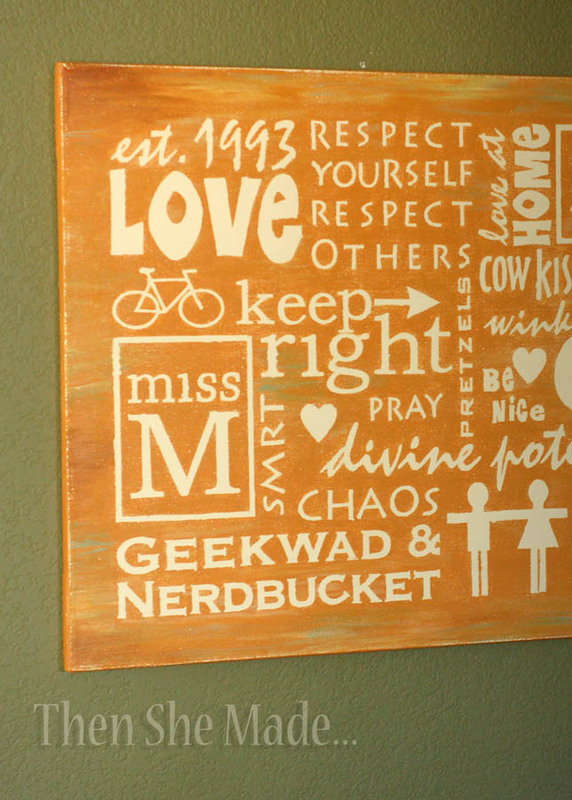 love how you did the lettering and it is so creative! This may be a dumb question, but how did you cut everything out so perfectly, like the bike for example?? So Cool!!!! I just don't any faith in my talent that I could do this! Great work! This is so cool. I wondered how to make one without a machine. I can see why you love this project. It's wonderful. Kris, unfortunately I don't have a cool cutting machine. So, I used Coreldraw to layout my words, then printed and cut them all out individually. It wasn't hard, just time consuming. A machine would have been great to have though. 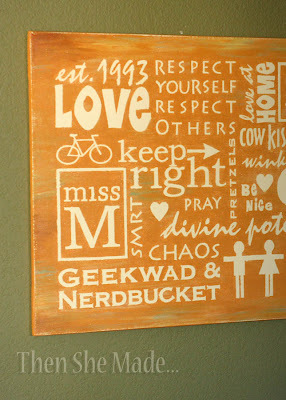 I love this and I've seen so many ideas on your site that I would love to do. I can't "Pin" things to Pinterest. Do you know why? Am I alone? Also, I don't think that I would dedicate the time to do this particular craft, but the link at the end didn't work for me. Please help! @ unknown. I was unable to add the 'pin it' button to my toolbar so I had to go to the page where you do it on Pinterest and just add that page to my favorites. Now when I see something I want to pin I just do it from my favorites. Is this what you meant??? As for the link not working I would just try googling the name. There are many companies that will do this type of thing. You can also have similar stuff done at your local copy shop. If you want to do it yourself, but don't want to cut everything out yourself you can order custom 'wall clings' on many sites (a few places on etsy.com will do them) and then just do the placement and painting part or you can have custom stencils done several places and do it that way. Another simplified way to do something like this is using painters tape in place of contact paper. Hopefully that helps. I have done some research because I'm planning a similar project. Thanks you so much for explaining this in details! I've wanted to know for some time now how to do this.